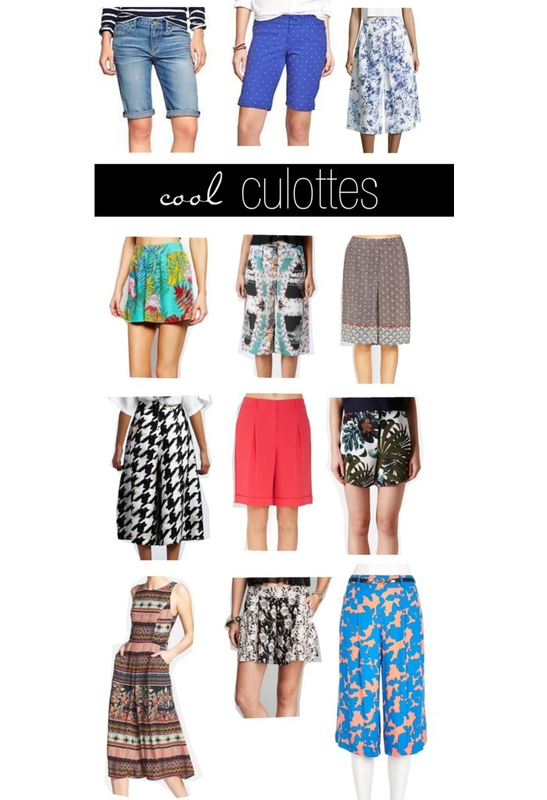 Okay, maybe not the entire shorts round up I featured today is 100% culottes. A couple are considered more of a Bermuda short style. My point is, this season, longer shorts are making a come back. Praise the Lord. Even though I haven't officially added this style to my closet, I do have the romper that I featured from Nordstrom today on the way. Let's just hope it looks as cute on me as it does on the model and it's on CRAZY sale. We all know that styles and fads come and go. The culotte trend is no exception. I vividly remember wearing numerous versions of these back in my elementary days. It's not like I could have held onto them until now, but hey, I can surely reinvent the wheel. I am interested to see how this trend takes flight and how long it lasts. I am all about experimenting, taking risks and having fun with fashion, but will be sure to take it slow and in small doses. What about you? We love the tropical one! Happy Easter!!! I think I may have to pass on this trend as I know I wouldn't wear them for long But some are really cute. The polka dot ones are my fav! I have to admit I tend to like shorts that aren't bermudas, but I have found myself looking at longer ones this season! I'm still into the short shorts......but I'm thinking my age is starting to dictate that I try some of these babies out. Good round up! I think the Culotte trend is a bit much for me (says the girl who can't wait to buy overall shorts! ), , but I LOVE the knew length denim shorts you show. Cute! I love all these fun prints but I just can't get on board with this trend. Although I say that and maybe I might try out the polka dot ones! I love that the longer shorts are back in style! I have two pairs that I have recently bought and I can't wait to wear them! Love the romper you picked out! Can't wait to see how you'll style it! That romper!! I may have to get it too! These wouldn't look right on me because I'm so petite...I'm all about the short shorts! oh i like all these options! and such great colors! I absolutely adore those blue dotted shorts on the top row! I can't wait to see you in that romper! It is fab! Good! I'm too old/short/thick for booty shorts! i ordered a few pair of maternity ones!!! http://www.shoedaca.com .I am sure you won't be disappointed.